With the introduction of the un-upholstered Beetle Chair, the collection has bloomed into a chair series with unlimited possibilities. 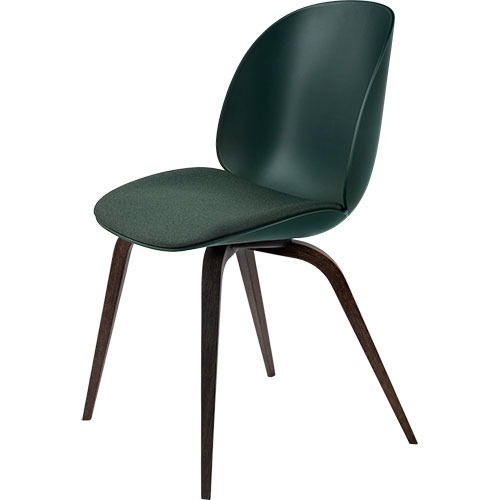 The Beetle Chair is no longer only an upholstered chair but also available with a polypropylene Hi-Rek plastic shell, giving it a lighter expression with notable durability at a lower price point. The chair’s subtle matte texture offers a soft tactility where its outstanding sitting comfort is obtained. Thanks to the wide spectrum of color and base options, the un-upholstered Beetle is an ideal solution for both formal and informal spaces alike. Mix and match between the seven harmonious colors to create a personal expression. The design of the chair reinterprets the characteristic elements of the beetles’ sections: shape, shells, sutures, rigid outside and soft inside. The comfortable yet dynamic design makes the Beetle Chair suitable for multiple environments whether it is in the home or the workplace. The chair is available with unupholstered Hi-Rek shell, seat upholstery or front and seat upholstered shell. Fully upholstered version available. Plastic glides included, felt glides available on request. The collection includes chairs, barstools, sofas and lounge chair. Other versions include swivel, castors or metal legs.